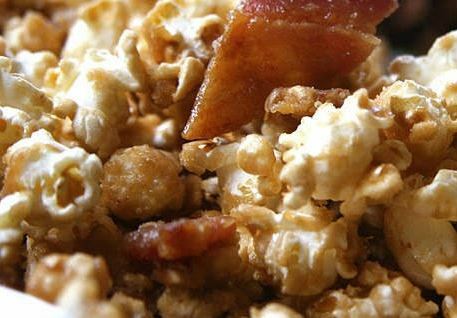 Chef Lance Knowling has cast some American favorite flavors in starring roles for his ‘Movie Night Bacon Cheddar Popcorn’ and the reviews are, well, the last bowl we made is empty so you decide. The premise is simple, pop corn in bacon grease, toss with salt, chopped bacon and shredded cheddar. Then devour. Those of us who are in the habit of saving our bacon fat in the freezer can make this recipe quickly. For everyone else, plan to fry up bacon in the morning before movie night and reserve the fat. Knowling is a Kansas City native who now calls the New York Metro area home. In the Garden State, his Indigo Smoke, and Indigo restaurants in Montclair drew high acclaim. Knowling’s current project is ‘blujeen,’ which is described as “Elevated American comfort food with Southern twists served in a stylish setting with a long bar.” blujeen is located at 2143 Frederick Douglass Blvd, New York, NY 10026. Knowling also originated the culinary tag #UrbanComfort.